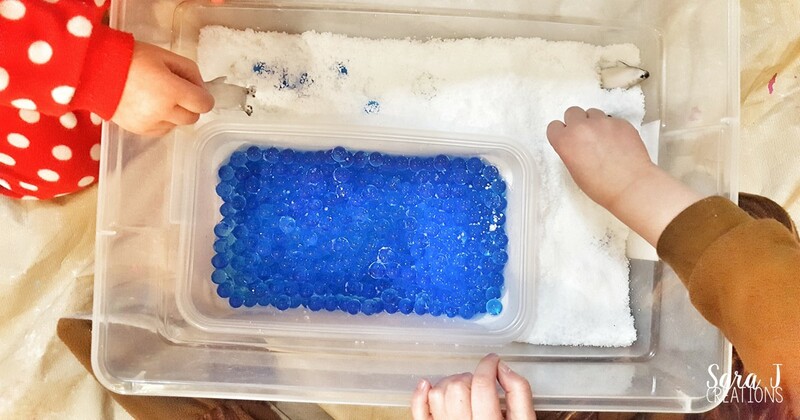 Last year, my girls loved our arctic sensory bin with animals and water beads. I wanted to do something similar this year - a winter themed sensory bin. I started seeing other teachers/parents on Instagram trying out this "fake snow" and I knew I wanted to try it. I figured snow would make the perfect base for the bin. Then we would add some blue water using the water beads again. Throw in some penguins and my girls can pretend they are in a penguin habitat. To make a bin similar to ours, gather the following ingredients. I put the water beads in a smaller bowl and added water. Once the water was all absorbed and the beads were still on the small size, I added more water to get them to really expand to capacity. I did these in the morning because it takes awhile for them to grow to capacity and I wanted to play with the bin in the afternoon. Next, I added the snow powder to the big bin. Read the directions that come with your snow. It says how much powder and water you need. I wasn't sure how much it would expand so we would make a batch, and then add more snow powder and water until we got the right amount in the bin. I felt like with the brand that we used, I needed more water than the directions said. From what I could tell, you couldn't really overwater it. It just keeps growing and expanding. The fake snow is a different consistency - it sort of feels like real snow yet it doesn't melt. It takes on the temperature of the water that you use, but I noticed when we came back to the bin the following day, the snow felt cold. Once all the supplies were in our bin, I added our plastic penguins. I let the girls just explore the different textures in the bin. The beads are squishy and slimy (but not in a gross way.) I find them very relaxing actually. The snow was warm from the water and then turned cold and had a grainy texture. My girls decided that they wanted to use some of the water beads as penguin eggs. They started matching up penguins and their eggs. This bin was definitely a hit. Of course, it didn't take long for my girls to mix the snow and the water beads. It didn't hurt either of them but it is hard to get them back to the way they looked originally if you are worried about that. The fake snow says it lasts a few weeks and we usually get water beads to last the same amount of time, so this is definitely a bin we can pull out all month long - even if there is some snowy icebergs "floating" in the water now.